Many of my trips involve travel by airplane, and sometimes I have connecting flights. This leads to quite a bit of time spent in airport terminals. 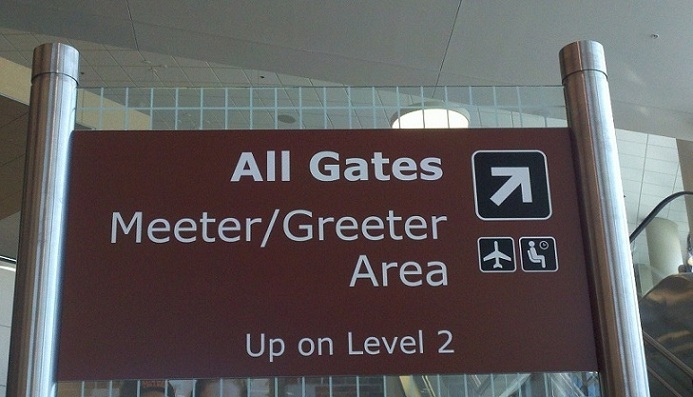 I know I should just go the gate and find a place to sit. But here’s what actually happens. The first thing I do is locate the gate for my flight. I do this more than once because sometimes the gate location changes. I’ll continually check the departure information to make sure it’s still the same. When I get to my gate I find that there isn’t anywhere to sit! People have really settled in, with their coats or laptops covering two or more seats. And many times the only seats available are in the bright sunlight, making it difficult to see anything. I believe I got sunburned once sitting in one of those seats. Another obstacle to sitting at the actual gate is that there’s usually at least one person who’s asleep (and snoring), laying across several seats. Once I see any of these things at the boarding area, I go to my “how to pass the time” list. One thing I like to do is visit the stores. I don’t normally buy souvenirs from places where I’m only at the airport, but there are jewelry shops, gadget stores, and food courts I can visit (and look for chocolate). Sometimes I multitask by watching other travelers while I’m walking through the terminal. If I’m on a people mover, I even feel as though I got some exercise. This is important because I’ve already eaten the chocolate I just bought. But eventually it’s time to go back to my gate, where I either stand or lean against a wall and read emails on my smartphone. I’ll be sitting on the plane soon enough! 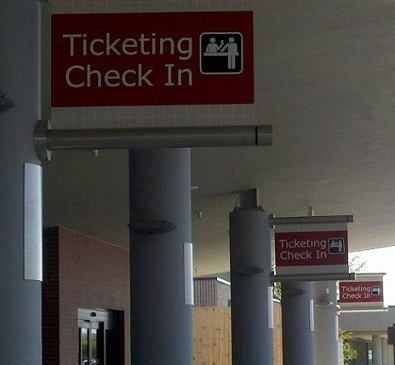 This entry was posted in New Orleans, Travel, USA and tagged airport, gates, people mover, shopping, signs. Bookmark the permalink. Creative use of otherwise wasted time. I take knitting but enjoy going to the store with all the gadgets. I like to browse at the gadget store, but I haven’t bought anything there (yet). I never thought of bringing knitting – that’s a great idea! It can get boring while waiting, I also like to wonder around the different shops, just “window shopping”, but it does annoy me a bit when someone has taken up seats with their items and I see elderly people having to stand or a Mum with a baby. I’ve noticed that too. People get their seats and they won’t move for any reason. Maybe there should be reserved seats for those who really need them. Thanks for that great observation! All the better for us Meg that you don’t just go to the gate and wait! We get to enjoy the view with you. Thanks for that. Thanks Rhonda! I like to walk around and see that’s there, so I really can’t imagine sitting for very long. Looking around makes the time go faster, too! I’ve not flown since 911. And due to TSA, I refuse to fly anymore … my rebellious nature won’t let me. But if I were to fly, I think I’d spend my time watching the ‘terrorist citizens’ being molested for being customers. It’s sad, too, because I used to love to fly. Oh well, I hope you get to enjoy your flights. I respect your decision not to fly. I’m sure you’ve found other means of transportation for trips. And when you travel by car (for example), you don’t have to worry about missing your connection! I went to Texas (from Virginia) in 2010. I drove for two reasons. One is because as long as TSA exists, I will refuse to fly, but the other is because it gave me an opportunity to actually see some of our beautiful country. The trip to Texas was a little rushed, since I had a deadline to meet, but coming home was delightful. The Tennessee mountains were especially spectacular. My only regret is that I didn’t have a driver, so I had to keep one eye on the road. All of the experiences that you mentioned in your post ring true, Meg, so true…! Thanks! I anticipate that there won’t be a seat and plan accordingly. So I feel like I’ve already had some adventures before I get to my destination! Thanks – it actually works, too! 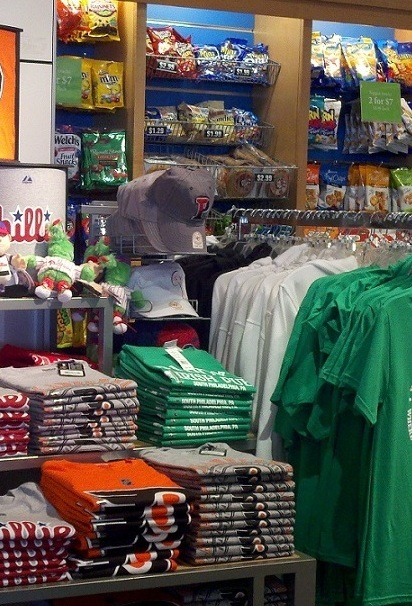 Shops, e-books, games, the tablet, and the smart phone help me pass time at the airport. Those are good suggestions! And I’ve noticed that some airports have docking stations where you can plug in your phone, tablet, etc. Things are looking up! Pen and paper work for me. Lots of options though. I like your thinking! You don’t need batteries, only your imagination to use a pen and paper. It’s a fine way to pass the time. Great suggestion! I like the idea of wandering around taking photos, I don’t think I’ve ever done that in an airport, oddly enough. There should be more interesting things to do in airports, because when you have several hours to spend there it can get really boring. I like finding the chapel/quiet room for a bit of reflection and a break from all the hoo-haa in the terminal building, but it’d be nice if there were more distractions, perhaps drop-in yoga classes or museums to look round. I’m sure a lot more could be offered. This is a good list of suggestions-thanks! A yoga class would be wonderful when there’s a longer layover. And I’ve been to a few airports that have artwork and historical items on display, and I really enjoy seeing them! That’s a good point – sometimes there are long lines for places to eat and you have to allow enough time for that. After that, I use the rest of the time doing “important” things, like finding good chocolate! Interesting post — I can definitely relate. I think having a “plan” really helps when you’re at the airport, especially since you have to be there so early! I consider it free time for just me (which is rare) so I buy a coffee and people watch, browse the bookstores to see what is popular now, look around the shops, read and write. I check messages etc on my smart phone and sometimes call a friend in the area. I love spending time at airports! I get so much done. You’ve given me a new perspective on airport time! It can be thought of as uninterrupted time to use any way you like. Thanks for that insight Darlene! I’m with Darlene. I am usually the happiest one in the airport, enjoying time to relax and read. Usually the lead up to a trip is so hectic, that having time to myself is simply perfect. A really good thriller works to help while away the hours when shopping, eating or people watching has run their course! I look at my pre-flight time as my time to decompress and day dream. I’m not one to sit at the gate…I get antsy. I like to go to the bookshop/newsstands, restaurants/bars and people watch. Flying makes me nervous so a drink usually helps. Great photos. I completely rely on my iPhone to pass the time at the airport these days – always the toughest part of traveling! I like my phone too (Droid) for keeping up. And I like airports that have areas where you can sit and recharge your phones! Nice post. I looooooove the yellow paint and flowers. So gorgeous! Thanks! 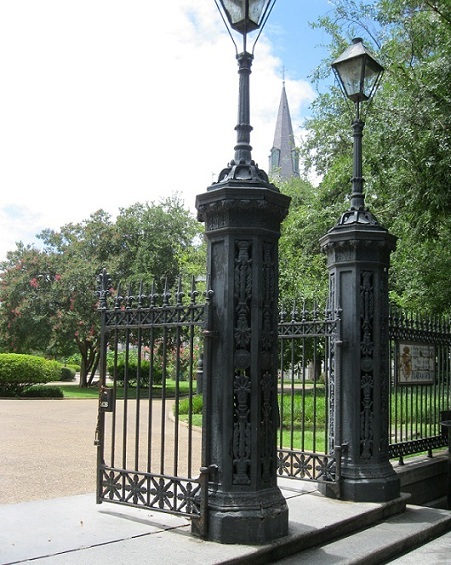 The picture is from the French Quarter in New Orleans, which I think is a beautiful area. I’m so glad you liked the picture! I’ll be traveling a couple times in the next couple months – once alone and once with my 3 kids…and not my husband…which is a bit worrying! Hopefully the airport time will be non-stressful! Thanks! Yes, having kids with limits one’s choices of activities! It’ll all work out and then in the future you’ll have great memories, too! 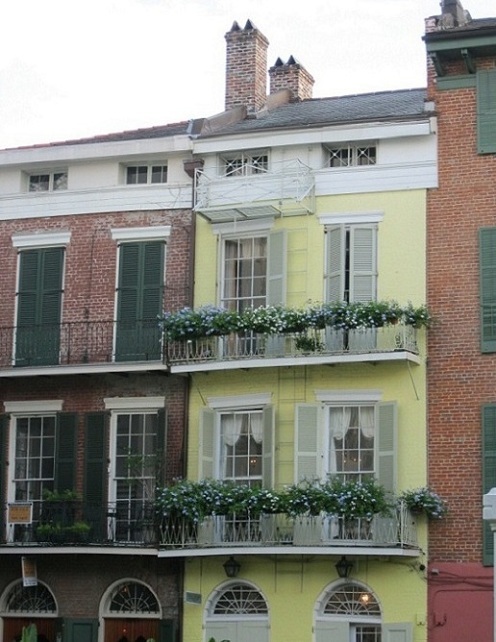 Good post — loved that flowery yellow house in the French quarter! Thanks for sharing that link! It’s good information since eating at the airport is pretty common now. 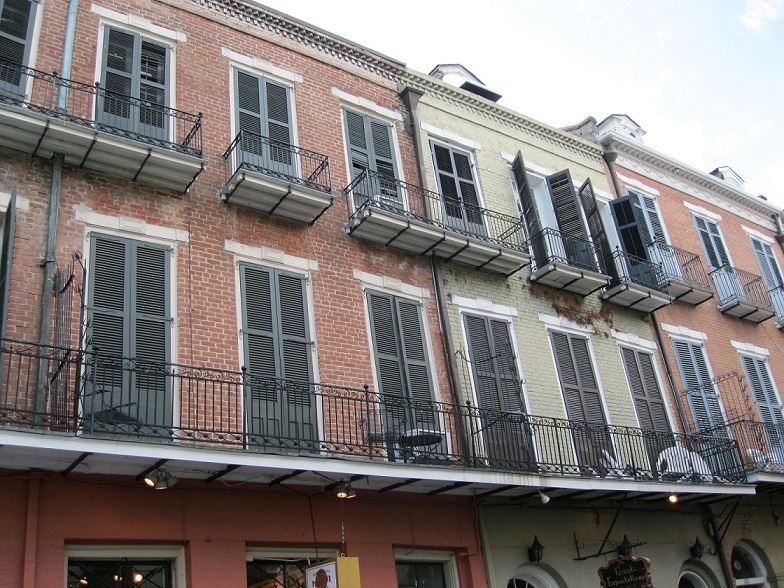 And thank you – the French Quarter is full of beautiful buildings! There are those who travel simply to arrive at their destination and then those who travel because they love the journey! I believe you’re the latter which is all the much better! Great post Meg. My husband is a seasoned airport guy, and I love travelling with him to discover all of his fun-filled airport habits! I’m a believer in joining an airline club…some are even free through a credit card. I can use the computer, usually have a free cocktail and a bite to eat. It helps when you a stuck in an airport for hours. They will try to keep you updated and if a flight is cancelled will try to get you booked on another flight. That’s another good suggestion! I’ve considered buying a one-day pass ahead of time. If I have enough of a layover, I think I’ll try it. Thanks Karen! If I can’t find a place to recharge my laptop or make a decent call home or to the office, I wander around smartly too. If I can find a seat in a not so crowded airport restaurant and I have time, I’ll grab a glass of vino & a snack while reading my Nook and people-watch. It sounds like you have a good plan for your airport time! It’s smart to have options to pass the time. Thanks for sharing that information! I think that I and my wife are doing quite same things, but there is one more which we do. We are looking at people very carefully and trying to guess from which country they are. Of course we never get the confirmation to our guess, but it is a fun play to us. In some cases cloths and bags reveal many things from people on travel. For us Finns, it is easy to recognize our country fellows. What comes to my wife, people think that she is Spanish, Italian, Russian, German, Swedish. Many times in Germany some people ask from her where to find some local place. I really like what you do! Sometimes it’s hard to tell where someone is from, but it’s still fun to guess. And I’m glad you enjoyed the post, too. Thank you! I forgot to mention: I love your shots in this post too. The first one is a special one. I, too, love to shoot windows with flower boxes. So charming! oh, cool! That’s a favorite city of mine. I’m remembering the signature double or triple balconies, I think, in your photo. I do much the same, window shopping is always good for passing the time and occasionally I’ll buy a newspaper or magazine to read because they’re light and relatively inexpensive so if I leave them on the plane it isn’t a big deal. Our international airport is pretty quiet as far as international airports go, there are usually spare seats and with plenty of powerpoints I can always do some last minute battery charging. I think that it’s nice to have a routine when you’re waiting at the airport. And the anticipation of starting a trip makes everything even better!